Did you know that there are various forms of payout options available with a Million Dollar Shoot out policy through Hole In One International? The first and most popular option is a 40-year annuity. 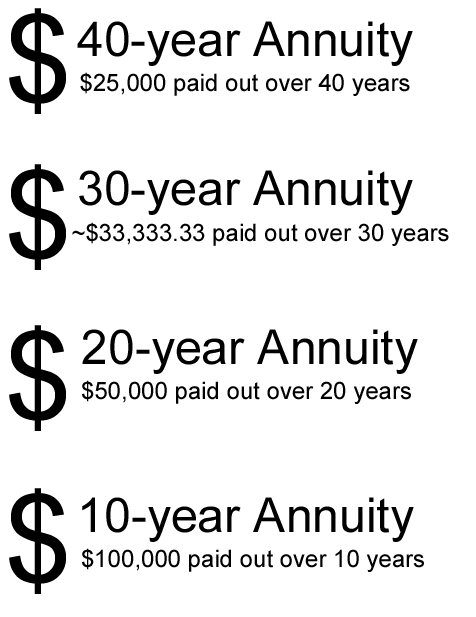 The 40-year annuity option means that the $1,000,000 prize will be paid out over 40 years ($25,000/year for 40 years) should there be a hole in 1. When it comes to pricing out a Million Dollar Shoot-out quote, a 40-year annuity will land you the cheapest price possible. The second most popular option is a 20-year annuity. With a 20-year annuity, the $1,000,000 prize will be paid out over 20 years ($50,000/year for 20 years) in the event of a hole in 1. Please note that this Million Dollar Shoot-out payout option is more costly than a 40-year annuity due to the fact that a larger sum of money will be paid out to the acemaker each year. Hole In One International also offers 10-year & 30-year annuities as well. While the 10-year annuity option is the most costly, it also allows for the maker of the hole in 1 to be paid $100,000/year for 10 years! Not too shabby! It is important to note that any prize value over $250,000 will be in the form of an annuity. Want potential acemaker(s) to win cold, hard cash all in one lump sum instead of payments? Then be sure to insure a prize that’s $250,000 or below! For quotes on a Million Dollar Shoot out policy or any type of hole in one coverage, please contact one of our contest consultants at 800-827-2249 or email us if you have any questions! Holding a Million Dollar Shootout guarantees that your next golf tournament will be one to remember!